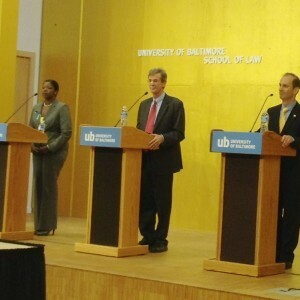 Listen in to the Maryland Attorney General Democratic Candidates Debate, which was taped on Monday, June 9, at the University of Baltimore Angelos Law Center. I was one of the journalists participating in the debate with moderator and University of Baltimore School of Law Dean Ronald Weich. Joining us for the debate were candidates: Delegate Aisha Braveboy, Senator Brian Frosh, and Delegate Jon Cardin. The other panelists were: reporter Roberto Alejandro with the Baltimore AFRO-American newspaper; and reporter Jeff Barker from The Baltimore Sun.